The Wilson Staff name is most known for their long standing tradition of player’s irons and the accolades that they have garnered from some of the biggest names to ever play the game. Today however, they find themselves seeking to rekindle that recognition amongst golfers as having some of the best all-around equipment out there. The M3 irons are a continuation of the FG Tour line we have seen in previous years, but they are anything but the same old irons. This compact head is loaded with the precision and feel of a blade, yet has the forgiveness of a game-improvement iron. The latest forged irons from Wilson Staff – the new FG Tour M3 irons – provide a forgiving option for the Feel (F) player valuing precision and shot-shaping. Optimized weight placement within each head is placed only where it benefits the golfer. Thin toplines on all irons allow for a lower center of gravity and a player’s look at address. The longer irons are thinner near the impact area for increased ball speeds and distance, but transition to thicker in the short irons for precision and workability. As much mass as possible is moved to the heel and toe in the long irons for an increased MOI and more forgiveness, transitioning to a more uniform thickness in the short irons for consistency and repeatability. Obviously the standout feature of the M3 irons aesthetically is the black finish. Although we have seen dark finishes on irons from Wilson Staff before (Ci11’s and now C100’s), they were a gloss PVD finish that traditionally wore faster than many would prefer. With the M3’s Wilson elected to go with a matte black finish, believing the rough texture would not only make glare a non-issue, but also wear slower. Time spent with the irons showed as with any black finish there will be wear, but in many rounds and range sessions only a slight fading beginning at the leading edge of the sole was visible. Overall, the finish looks astounding and by all intents and purposes appears that it will continue to do so even as it wears over time. 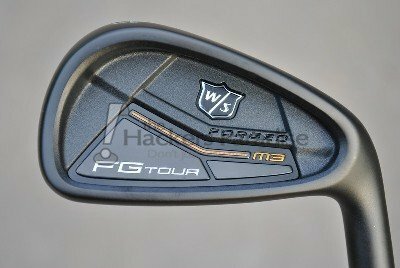 The rest of the package is rounded out with cavity badging, which is quite modern looking from what might be expected out of Wilson, but overall the angles and lines fit in well with the rest of the M3 lineup. The lines and curves combined with the classic Wilson Staff badge and gold accents tie the entire look together. As it pertains to the actual build, the M3’s are most definitely more of a players/GI hybrid than their two predecessors in the FG Tour line. Although they are based around being “Feel” irons for players and shot-makers, there is a lot here that lends itself to the GI side of the golfer spectrum. Obviously the black finish will help with the overall size appearance, but the profile should still fit a majority of eyes. 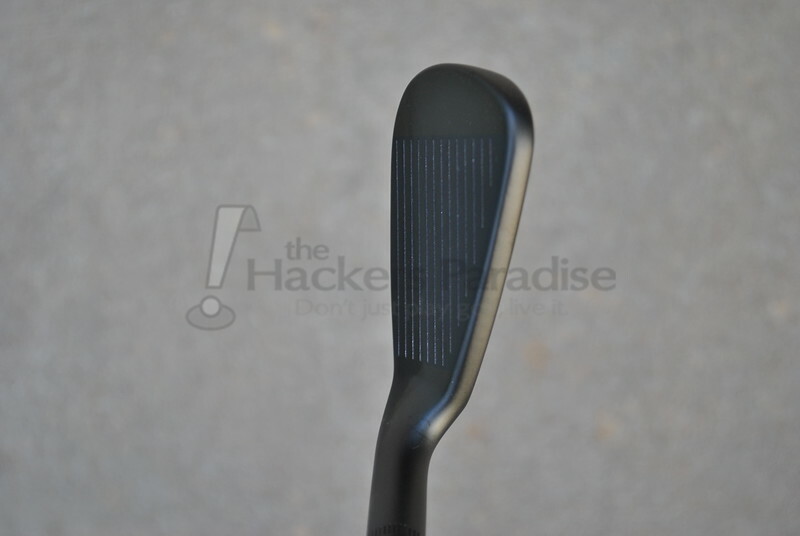 The topline is slightly larger and squared off than most players irons, but not thick by any means. The offset is marginal as a part of their progressive nature, but at no point is it too much for the class these are intended to fit into. Most notably, the soles have a little bit of trailing relief that makes them appear a bit thicker, but in reality their size is quite acceptable and also instills confidence that if caught a little heavy they will still perform. 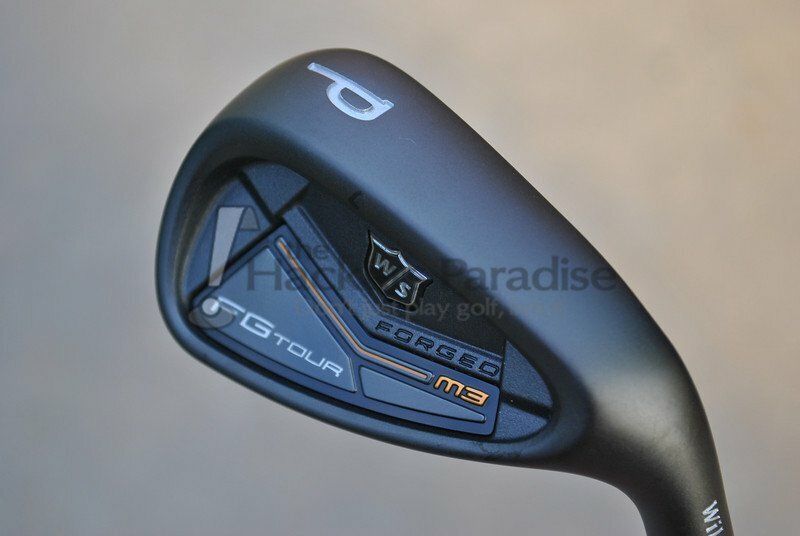 For this review THP was sent the FG Tour M3’s in a 4-GW setup paired with the Dynamic Gold XP S300’s. One of Wilson Staff’s major selling points with the M3 irons is that they are a forged 8620 carbon steel iron, which is intended to give that “forged performance” and feedback that many like to consider a necessity in a set of irons like these. 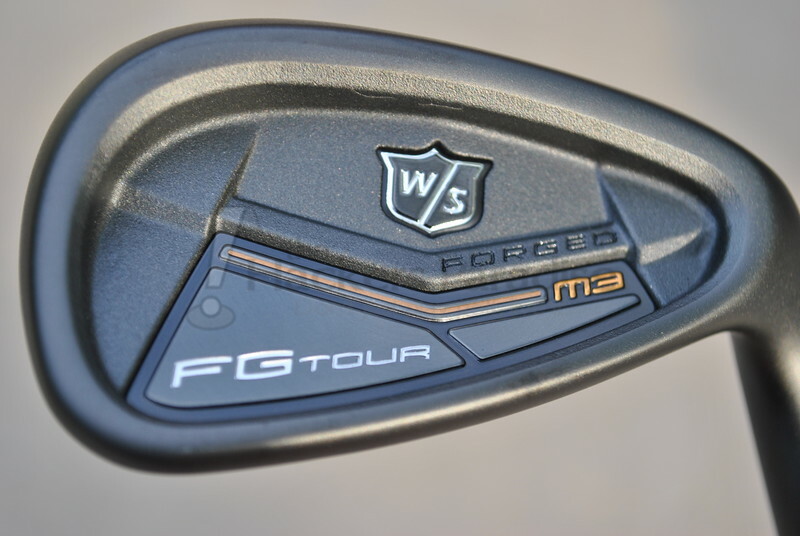 With the forged debate cast aside as it pertains to the actual implications on the feel and performance of the irons, the M3’s provide a very unique overall feedback. Actual audible feedback at impact is a very solid and deep click that is different from the majority of irons out there. Thanks in large part to the solid nature of the sound, misses are easily identifiable audibly as well as through vibrational feedback to the hands. In the case of the M3’s the feel will definitely be liked or disliked on a case by case basis. After all, feel is an incredibly personal trait in golf clubs. The decision to pair the M3’s with the XP version of the S300’s was an interesting one on Wilson Staff’s part, as with the FG Tour’s and V2’s we saw them go with full weight KBS Tour and Dynamic Gold shafts. Not only are the shafts lighter with these irons, they also generate a slightly higher launch as well as a bit more spin. When combined with the lofts of the M3’s that resulted in a “mid” flight that performed well both into the wind as well as holding greens. Most interesting is that the long irons launch quite well for a set of this classification, no doubt in large part thanks to the thinner faces and increased perimeter weighting within the long irons. All of the clubs in the set proved not only to be hittable off the tee and the deck, but also possessed the ability to shape shots as well as the user’s swing would allow. This area was under the most focus coming into this review because they M3’s are categorized under the “Feel” portion of Wilson Staff’s F-C-D system, and with such a classification the emphasis is on playability, workability, and consistency. While all of those traits are important, distance and overall forgiveness are equally as such, particularly with so many solid options on the market. 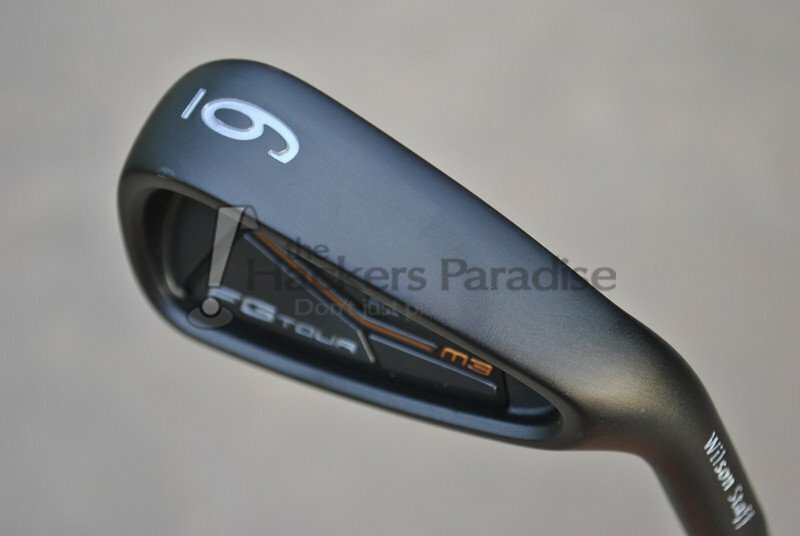 The M3 irons feature what many consider “traditional” lofts. Based around a 48-degree PW, they are weaker than the trend we have seen recently, but it should be recognized that they are just more in line with a player’s iron. An interesting twist though is the overall playing length of the irons. They are quite long. In fact, they are ¼” to ½” longer than the vast majority of irons on the market, and this is definitely something that should be kept in mind when trying them out. As for the overall distance and forgiveness, the M3’s are right on par with what would be anticipated. Distance is no longer or shorter than comparable style irons even given the weaker lofts and longer lengths, which since these are not designed to be distance irons makes perfect sense. 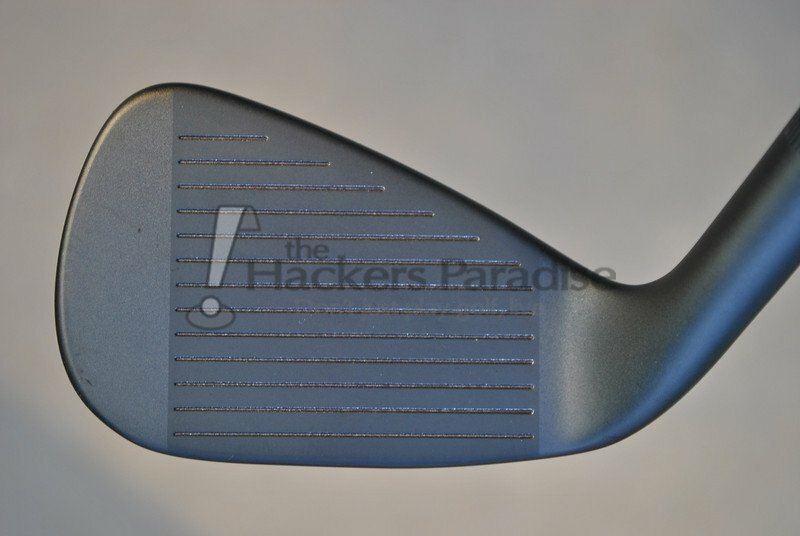 They also offer well-rounded forgiveness for a consistent swing, but again they are not designed to carry super game improvement traits on misses. While they will be playable for a larger margin of handicaps than most might initially think, as with anything it will all come back to the swing repeatability. When talking about versatility, most thoughts go on how the clubs perform in adverse situations of various types. For the M3’s, a lot of focus centered on how they performed in the rough, since they have so many player’s iron traits in terms of overall size. 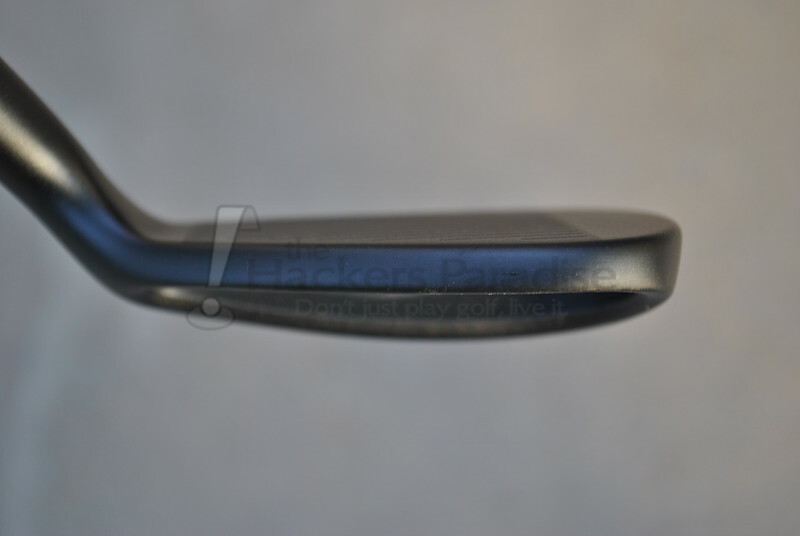 However, thanks to the sole with it’s slightly elongated trailing edge, the club really kept nice turf interaction from both tight lies and the rough with no major instances of digging or twisting through impact. Additionally, flighting the ball was never an issue (nor was fading or drawing), playing right in line Wilson Staff’s classification of the M3’s ad “Feel” irons in their F-C-D lineup. No one can deny that Wilson Staff is making a major push towards grabbing the attention and consideration of golfers with the offerings in their 2014 lineup. In the FG Tour M3 irons they have brought forward a design that will appeal to players looking for the same playability and overall feel that Wilson has been known for, and at the same time they are showing their willingness to push things to a new place with the overall aesthetic package. The M3’s are solid irons that offer just what Wilson Staff intended them to – feel, consistency, and enough forgiveness to get the most out of the entire package. The 4-GW set of FG Tour M3 irons come with an MSRP of $799.00 in steel and $899.00 in graphite. More on the M3 irons and the rest of Wilson Staff’s lineup can be found at www.wilson.com. Great stuff Jman, Wilson is really bringing it lately and I am glad to see them becoming more and more of a player in a market they once dominated. The irons sound like they should be on the radar on many folks looking for a new set. Great write-up. I love the more traditional loft and the PW playing at 48*. That allows for more a bag set up that I prefer–with a gap or SW and LW. Sounds like Wilson has another solid product on their hands. Good night those things look good from the top! No nonsense, no outrageous claims, just beautiful and traditional golf clubs. Outstanding Wilson!! I have these irons and they are really nice. One small thing that should be corrected is the pitching wedge is 47 degree (not 48). Not a big deal, but I wanted the lofts to blend better with 54/58 wedge combo and had then bent to 1 degree strong so my PW is 46 and gap is 50 etc.. Fantastic review James, these sound like a very well rounded set of irons. I’m not a big “feel” guy but I realize that many are so to tout these and look and feel of a blade with forgiveness of a GI iron is something that catches my attention. And from your feedback, they didn’t disappoint. I’m really hoping that my lack of experience with Wilson Golf can change pretty darn soon. just bought a set with the 95 stiff grafite. best looking set of irons i’ve ever had. this is a remarkable set of irons ..
Great review Jman! They look great. Not sure I’m talented enough to play them but the clubs and your review make me want to try!